For the uninitiated, Me First and the Gimme Gimmes consist of Lagwagon frontman Joey Cape onthe guitar, Chris Shiflett (Foo Fighters) on the other guitar, Lagwagon drummer and Fat Wreckutility superhero Dave Raun on the skins, and are rounded out by Fat Wreck-head-honcho/NOFXmain-dude Fat Mike, and incomparable crooner Spike Slawson. Together, Me First and the GimmeGimmes — an outfit that has always operated more like a beer-hall Pussycat Dolls than a regularmortal band—contain so much hot air, so much pomp, so much attitude, that it’s a wonder thatthese guys can still manage to pull their five individual tour buses into the same parking lot, puttheir differences aside and belt out the ballads without clawing each other’s eyes out. But they do,for the love of the fans, the music, and of course, the applause.So, what is really left to say about punk super-group and cover band extraordinaire Me First andthe Gimme Gimmes? After 7 studio albums, a live record and too many singles to count, they’vetackled just about every genre under the sun. Be it Motown, Country, show tunes, Japanese Pop(sung in Japanese! ), these seasoned punk rock pros have triumphed on every occasion in a wayonly the Gimmes could. 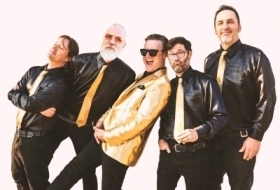 With such an extensive and wide ranging catalog, where does one begin?Me First and the Gimme Gimmes will be on a worldwide tour in 2019 so be sure catch them live.When duty calls for one of the Gimmes to perform with their other band, rest assured a travelingGimme will step in. Scott Shiflett, you guessed it, Chris Shiflett’s brother and guitarist for Face toFace will be filling in and on occasion, Jay Bentley from Bad Religion will sub for Fat Mike. Thepowerhouse continues and they’ll be singing ballads, showtunes, Country and Motown tunes allyear long, so don’t miss it!